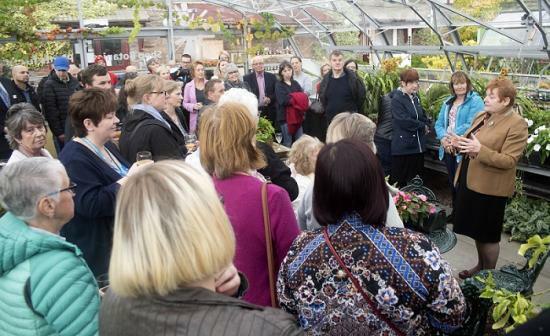 A much loved local attraction celebrated its 25th Anniversary last night when members of the team that shaped the development of High Life Highland's Inverness Botanic Gardens and Nursery joined guests to mark the 25th anniversary of the gardens. Mike Hann, the original creator of the gardens gave a talk outlining the development of the garden and how his plans have taken shape in the 25 years since the inception of the site accompanied by a series of illuminating historic pictures highlighting the journey. Highland councillor Margaret Davidson who was in attendance at the anniversary both in an official capacity as Leader of The Highland Council but also as a guest speaker at the event said: "Inverness Botanic Gardens and Nursery was a hidden gem in the city for many years, but it is fantastic to hear that so many are now attending with visitor numbers reaching almost 100,000. "It is such a great attraction for the City of Inverness whether visiting the great gardens, viewing some of the collection in the cactus house or just popping in for a coffee and chat with friends, it's a great venue and I look forward to seeing the site continue to develop and grow over the next 25 years."